A WOMAN IS A GIFT!!!! Hearing a guy say, ” Yall women think y’all should be put on a pedestal.” A grown woman should not THINK she should be put on a pedestal she should KNOW without a shadow of a doubt. We all know the story of Adam and Eve. God created Eve from the rib of man to be his helpmate. Just think how a woman’s body works like a well oiled machine. A woman’s body goes through a monthly process in order to bear children. She carries a child for 9 months and has a natural motherly instinct to love and nurture that child. This is not to discredit a man’s role, God made man to be the head, the protector, and provider. However, a man does not go through the same things women go through. It takes a man 5 minutes to create the life a woman carries for 9 months and guess who’s body goes through transformation? THE WOMAN!!! Who goes through countless hours in pain to bring that child into this world ??? 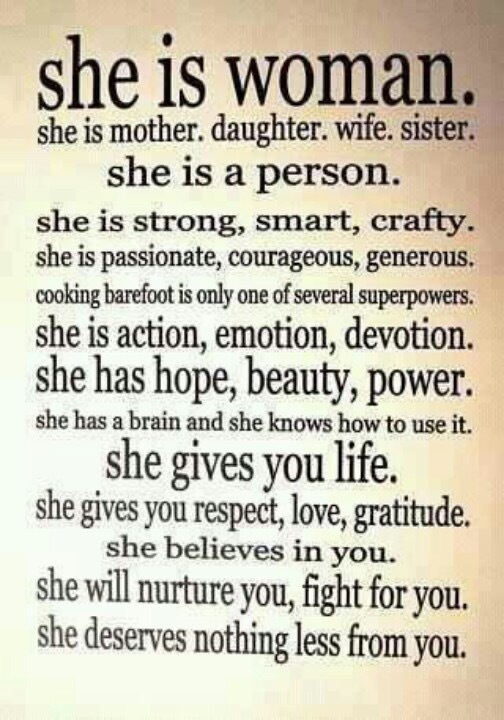 THE WOMAN. It doesn’t stop there! The women who wipe their children’s tears away, fight for the injustices to their families,who selflessly serve day after day with little or no appreciation, who juggle working and parenting and sleepless nights and endless guilt, who love their husbands fiercely, who is the glue that keeps their family together, who continually look after everyone’s needs except their own. They are definitely in need of being placed on a pedestal! We were made by God to help and we are built to love and nurture. Men build the homes but the women add that special touch of ❤️ inside the home. God made this miraculous piece of work for man. Her name is WO-MAN AND SHE IS A 🎁. A 🎁 that should ALWAYS be put on a pedestal.